If this is your first encounter with the criminal justice system, it’s easy to feel overwhelmed by the many choices you are asked to make during the course of your case. Among the most vital to your defense is your choice of representation. Because the U.S. Constitution guarantees each defendant representation in court, you are always assured of having legal counsel. But should you hire a private attorney or accept a court assigned public defender? To help you make a more informed choice, let’s look at a few advantages and disadvantages of each possible selection. It is important to note that, whether you use a public defender or a private attorney, both are able to easily work with you if have also chosen to work with a certified bail bondsman. A public defender is free of charge—The Constitution guarantees each defendant the right to counsel regardless of ability to pay. Because a public defender is appointed by the court, you will never be asked to pay an attorney’s fees. 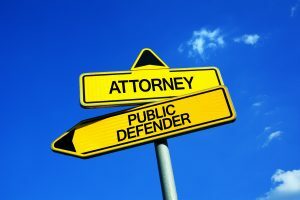 Most public defenders know the landscape—An experienced public defender is likely familiar with a wide variety of criminal cases and has probably defended someone facing charges similar to yours. This experience can give a public defender a strategic advantage in handling your case. Public defenders are acquainted with prosecutors—A public defender is likely familiar with members of the state’s prosecution team, which can make reaching a plea agreement easier. You don’t get to choose your attorney—Public defenders are assigned by the court and are chosen based on availability—with consideration for neither your preferences nor the details of your case. Public defenders have little time to devote to any single case—The common image of the overworked and underpaid public defender has some basis in fact. Public defenders are government workers, and as such, they tend to carry heavy caseloads and to receive less compensation than do private attorneys. This means they have less time and fewer resources to devote too any single case, including yours. Public defenders are motivated to keep cases flowing—Public defender may be more likely to plead out your case as a way to reduce an already burdensome caseload. A public defender has a powerful incentive to keep cases moving, and little incentive to go the extra mile for any single case or client, especially when doing so would result in delays and increased paperwork. A private attorney has more time to devote to your case—That means more time to meet with you to discuss important details, as well as more time to discover and exploit any weaknesses in the prosecution’s arguments. A private attorney has a broad array of resources— Clients who are able to afford private representation may also be able to pay for additional assets such as independent lab testing of evidence, expert witness testimony, private investigation service, as well as additional paralegals and support staff. A private attorney is easier to reach—While public defenders are severely limited in the amount of time they can spend with each client, a private attorney has fewer such restrictions, allowing for increased communication between you and your lawyer. Cost— Private representation can be very costly. Attorneys (and their support staffs) bill hourly and their rates can vary widely. Be sure you or your family has the financial resources to absorb the added expense of private representation. We hope this quick review helps make your choice of attorney easier. At Bond James Bond we understand how stressful it can be to go through criminal prosecution. Remember that an experienced and licensed bond agent is your best ally in securing your release prior to trial. Contact us and discover what Bond James Bond can do for you.